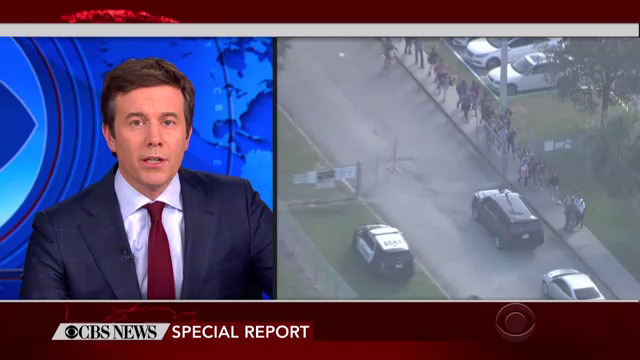 Broadcast and cable news networks are in continuing coverage of an active shooter situation at Marjory Stoneman Douglas High School in Parkland, Florida, in Broward County. CNN’s Brooke Baldwin reported the news at 2:55 p.m., FNC’s Dana Perino reported the news at 2:56, and MSNBC’s Katy Tur began MSNBC’s coverage at 2:58 p.m.
CBS News broke into its regularly-scheduled daytime programming with a special report, anchored by CBS Evening News anchor Jeff Glor, at 3:13 p.m. “There appears to have been a mass casualty incident at a school in South Florida. 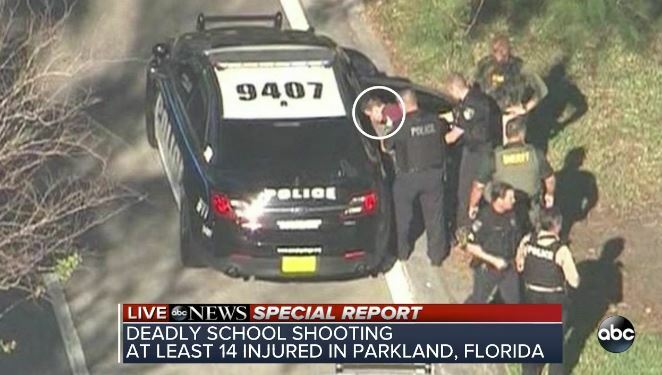 A shooting at Marjorie Stoneman Douglas High School in Parkland is what you’re looking at right now,” Glor said as the network aired a feed feed from its Miami station WFOR. ABC News’s George Stephanopoulos broke in to programming at 3:15 p.m., with coverage from WPLG. After setting the scene he got a young man named Michael Katz on the phone, a student at the school. Another student called in to ABC’s coverage telling Stephanopoulos the school is like a small university with several buildings and 3,000 students. That is making it challenging for law enforcement to track the shooter. NBC News, with help from station WTVJ, broke in with a special report at 3:24 p.m. ET, anchored by NBC News correspondent Kristen Dahlgren. NBC was airing coverage of the Olympics at the time, but has continued with coverage from South Florida. In Pyeyongchang, Lester Holt joined the coverage Thursday at 5:58 a.m. Korean Standard Time. On Fox News, Shep Smith took over for Perino at 3 p.m. He welcomed in Fox TV stations at 3:15 p.m. ET. Smith’s well-versed in the area. He used to report for WSVN in Miami, and is someone who, sadly, has covered more school shootings than anyone else on cable news right now. Ali Velshi took over for Tur at 3 p.m. on MSNBC. Brooke Baldwin remained on the air for CNN.